How many people in here are a small to medium enterprise that have their own website? How many of you have a database like he mentioned? About half maybe. How many of you email them more than once a week? Okay. That’s actually good. It’s money for nothing, guys. If you don’t have it, what he talked about is something you should be doing. Anyway, I’ll get onto my presentation about conversion and optimization, if I can figure this thing out. Here we go. My name’s Rob Wood. I run a website called Light Stalking about photography and it’s one of the top 10 tutorial sites for photography online. We write tutorials and guides about the topic and we have a thriving photography community in the form of a user forum where people can ask about photography and get feedback on their own work. We also sell various tools for photographers such as e-books for Lightroom and Photoshop. We have a spin-off company called Photzy.com. It’s a digital lobby for photographers which basically is a place for them to keep their learnings and their ebooks and their courses and what not. We were founded in 2009. We’ve been visited by about just about 28 million people. We have been mentioned and shared in Digital Photo magazine, by Adobe themselves who make Photoshop, CBS News, National Geographic, Canon, Nikon, SeenIt, LA Times, blah blah blah. And we’ve also been referenced in a heap of books as well. We usually during the yearly survey of the photography community get mentioned as somewhere where people go to find information about the topic too. Our traffic from the outside is anything from 400,000 to 900,000 a month. We have 150,000 Facebook fans, 400,000 Twitter followers. And anyone heard of vanity metrics? They’re all vanity metrics. They don’t really mean anything. The only thing I’m doing business for is to make money. 400,000 Twitter followers. Any guesses on how much traffic that sends? Close. About 10,000, sometimes 5,000, sometimes 15,000. It doesn’t mean anything. So when you hear all these big numbers, just don’t worry about them too much. The only thing that really matters is how much money you are making. Anyway, prior to Light Stalking, I was working for an online travel brand. Their PPC campaign, they were spending a couple hundred grand a month on PPC. That’s where it starts to get serious, starting to make money there. They’re the sort of figures that you should be looking be looking to emulate. The other thing I want to note before I get into the core of this is that 90% of the things I’ve tried online have been embarrassing failures. Don’t be afraid to try new things. Everything, well, almost everything in my case, fails. I’m sure there’s some smart people in the room who get that number up a fair bit but, for me, I test everything, I try everything, and I stick with what works. 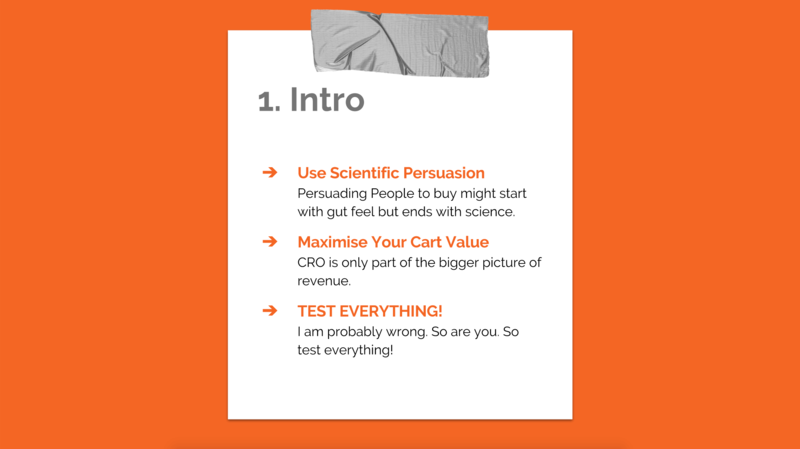 Anyway, let’s jump into conversion rate optimization. This is my basic approach to what we’re talking about. I want to get people to the website, but then I want more of them to engage. I want more of them to buy my stuff. I want more of them to sign up to my database. So that’s what I’m talking about today. When you start putting together a page of your website with the intention of selling something online, there are a couple of ways to go about it. One is gut feel and one is using persuasive design. Gut feel is underrated, I’ll give you that. Often, you’ll know a lot more about your industry than a general talk like this is able to help you with. But everyone rates their gut feel way too highly, so you’re probably wrong and so am I. So test everything and test a few of the things I’m gonna tell you about today. These days, I pretty much don’t trust anything I think about online, so I have to research. The thing about persuasive design and persuasion online is there are a lot of very smart people who actually study it and there are a lot of theses written about it and books written about it. The principles that you can apply to your websites and landing pages have a long history in online marketing. Just so we’re on the same page, when I talk about a website, I mean the whole thing. When I talk about a webpage or a landing page, I’m talking about a specific single page that you’re looking at on your website. There’s a guy called Robert Cialdini, anyone heard of him? One, two people. He is the king of pop psychologists when it comes to the field of persuasion. He has written several books, a Ph.D. thesis, countless interviews, videos, and articles. You should look him up and you can even read his peer-reviewed stuff if you’re really into psychology. I don’t recommend it. It’s awful. There’s a lot better books for a popular audience like us. His main book was written in 1984 and it’s easily the most influential book about designing for the Internet that I have read. What he says about persuading a person to do what you want them to do boils down to six main principles: reciprocity, scarcity, commitment and consistency, social proof, liking, and authority. Your webpage and website should have all of these elements on it, especially the landing page. When you’re trying to get someone to buy, these things need to be on it if you’re serious about getting them to take that action. These can be applied to basically any situation, by the way, salespeople are all over this sort of stuff. Politics, career, romance, and conversion rate optimization all have elements of this in them. Let’s jump in and have a look at a few of them. This basically means giving something away on your website or your webpage to get something in return. People are hardwired to pay back their debts. Not paying debts results in anxiety and negative emotion, and that’s what people want to avoid. You’ve probably been in a shopping center and someone’s come up to you with a plate of cheese or something like that and forced you to pick something up, a little piece of hamburger or something. That’s a classic example of a salesman who’s using reciprocity. So when you turn away and you walk away eating the piece of cheese, you can feel their eyeballs burning into the back of your head because you haven’t purchased. They don’t care, they’re on $15 an hour. The person above them has told them, “do this and these people will come back to you and they’re more likely to buy”. That’s exactly why they do it. That’s why these people hold these plates of cheese out. So what can you do on a website? What is your plate of cheese for a website? The dark side of the screenshot above is a website from a company called HubSpot called How strong is your website? It’s a little tool. You can type in your URL and in order to get the results, you have to put in your email. Classic example online, probably the classic example of collecting a database by giving something to get something. You can do a lot of things with that, like we give away case studies in return for an email from a little popup on our website. A few other examples, during the Boston bus strike Uber gave out free rides, Spotify gives you 30 days of free music, Gmail gives you probably the best email system in return for being able to advertise to you. 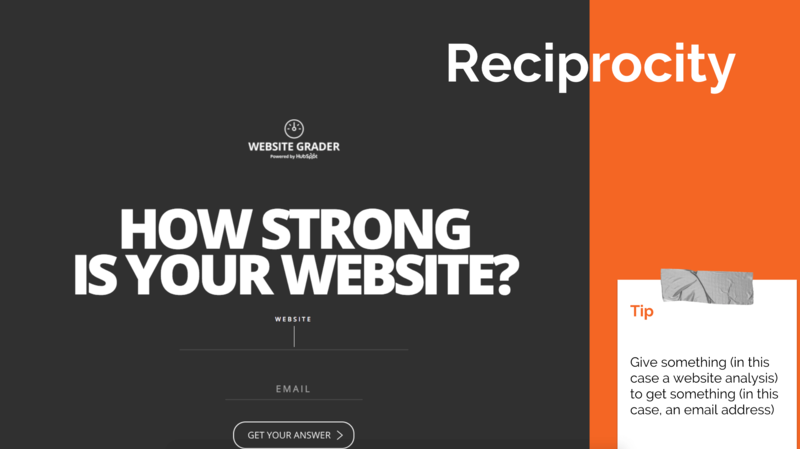 There are examples of reciprocity all over the net. One of the easiest ways to get reciprocity happening on your own website as a whole is through a blog. If you’re producing big, long, useful pieces of content, people will tend to try and repay you for that. If they’re getting value from it, then it’s something that will work for you in the long term. The next one is scarcity. When somebody thinks they can get something right now but maybe not later, they’re far more likely to buy it. I want you to picture this. It’s Boxing Day. You’re at home with your family. The evening news comes on television and it’s a bunch of mad people in Sydney. Any guesses what they’re doing? Boxing Day? Yeah, the sales. So why are these people who are perfectly normal people acting like idiots? You know, some of them were wearing crash helmets last year. They’re trying to get in the door of Myer in town. Some of them were in fist fights for the $20 microwave. This is the power of scarcity. That microwave won’t be there tomorrow. You can get people to really act like idiots when they think something is scarce. Now, I’m not saying you should do that, but if there is one part of Cialdini’s thesis that you should take note of it’s the scarcity principle. If you have something on your website and the person knows it’s not gonna be there tomorrow, they’re going to buy it or they’re going to be a lot more inclined to buy it. The worst thing that can happen online when you’re using this, luckily for us, is that somebody buys your stuff who can’t quite afford it. I mean, I don’t know your businesses. For me, I have a 100% policy of if you for any reason didn’t want what you bought, you can come back and I’ll give you your money back. that obviously doesn’t work for every business but it’s a way to just sort of make sure that you’re not taking things too far because, as I said, some of these concepts can be quite powerful. And there’s an example. 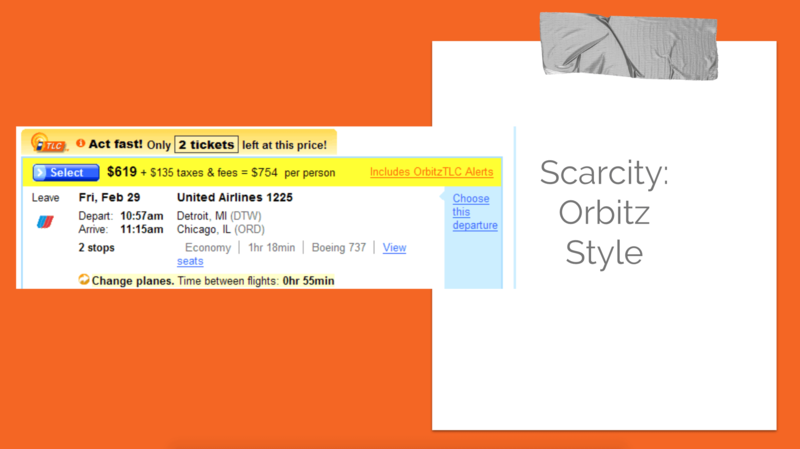 Anyone ever bought an airline ticket and seen that little line at the top? Act fast. Only two tickets left at this price. Classic scarcity. I don’t know if there actually are two tickets left or it’s just rubbish. There’s probably…I imagine it’s legitimate but who knows, I’m sure there are many, many people online who are using this in an illegitimate way. But the thing is it does skyrocket sales and if you have a way to incorporate it into your site, you should do it. What Myer does on Boxing Day isn’t cool so don’t go down that path too far. The other website you’ll notice that does it Amazon.com. If you log into Amazon at any time, there’s always a Deal of the Day section with a countdown timer and everything like that. That makes them a lot of money. Countdown timers on a website, they look tacky but they do work. So take that for what it is. Commitment and consistency are the next parts of Cialdini’s research. Once a person has publicly committed to something or somebody, then they’re more like to try to deliver on that commitment. If you look at Amazon.com as an example, I’ll often buy a business title on my Kindle to read on my phone. It’s really handy to have them there on my phone so I can go to them in real time, I can talk about them when I’m talking business with people. In my peer group, I get it out if we’re talking about something specific. If I’m honest, the persona of that tech-savvy entrepreneur is probably how I self-identify. That’s part of why this next bit is so powerful. Amazon has more than enough data on me to know that that’s probably how I self-identify, just from the books I’ve bought and the pages I’ve looked at. When I log into Amazon, that’s what I see. This is my login screen, by the way. Top row, there’s a lot of business Kindle books and they’re all very related to what I just purchased before and what I’ve looked at on Amazon quite often just on my phone on the way home on the train or whatever. And the other stuff I like reading, well, I like… my recreational reading is usually about big trends like oil or plastic or grain or stuff like that. I like reading about how big markets work. If you look at that last row of books, how about that? They’re all physical books and they’re all on those big market topics. And I also love history, so again, if you look you’ve got “Content Chemistry”, a book about publishing content, which is what I do and I love the concept of it. You got a book about Turkey, the history of politics of the whole country. Yep. Another thing I’m interested in, for sure. “1453”, another history book. Amazon basically nailed that. I would happily purchase any of the top row and any of the bottom row and sit down and read them. That is Amazon working from my commitment and consistency about self-identity. So if you have a way of doing that, if you have a way of getting people to commit to what they are, I often refer to people on Facebook as you photographers. So that gets them…oh, I’m in the zone. Yeah, I’m a photographer. When I get through to Light Stalking, that’s how I’m thinking. So you can do that on your own website as well. If you show somebody that other people like them have taken a specific action, then they’ll be more likely to take that same action. Social proof is one of the most powerful and easy things to display on a website. This one is something you can do today, there’s no excuse for not having social proof on your website. Ask who has used your services or purchased your product or recommended you in any way. 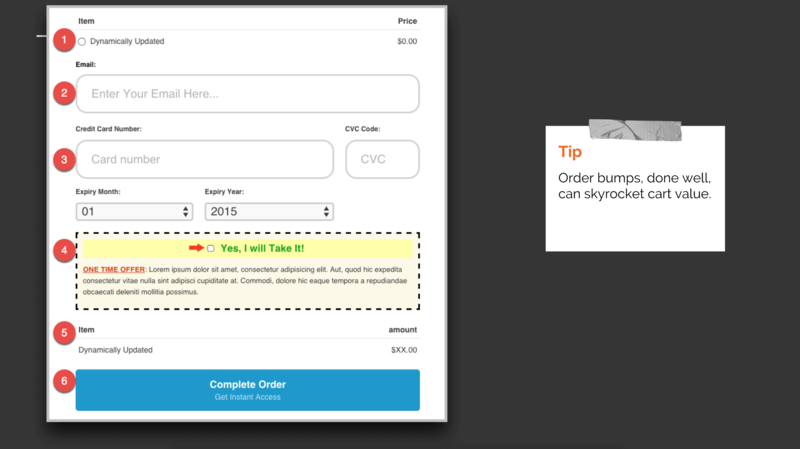 How can you convey that approval to new people who hit your landing page or website? The easiest way for this is through the classic old testimonial. Make sure that you’re collecting them, by the way, I have a Gmail folder, any testimonial that comes in goes into the Gmail folder so when I’m building the landing pages and website in the future, I can just go back to the email folder and have a look through for a few juicy testimonials that I can use. And then basically I just copy and paste those into the landing page that I’m building as testimonials and test it from there. Other ways of displaying social proof include reviews, there’s “As seen on” or “As seen in” banners, popups that show when somebody has purchased something, and I also keep a list of Light Stalking press mentions at a website called ScoopIt where people can see where other people are talking about Light Stalking. Has anyone been to Kogan.com.au to buy electronics? Yeah, a lot of people. You know those little popups that come out down at the bottom when someone’s purchased something? You’re looking at the website and suddenly this little thing comes up at the bottom, John Smith from Sydney bought such-and-such an item. That’s a classic example of social proof, there’s a bunch of plugins for various websites that give you exactly that or they just use a feed from your payment mechanism and then display the name. So they’re worth doing. They convert. Kogan is a conversion machine, they test a lot of stuff of those websites, so Amazon, Kogan.com, they’re websites you should be looking at just to see what they’re doing. Social proof is more powerful if it comes from people who are like your buyers or your leads. Cyclists are more likely to listen to other cyclists. They’re more likely to react to third-party mentions of your product if they come from cycling companies. So, think about where you’ve been mentioned, where you’ve been praised, and how it relates to your buyers. And when you can tick off all of those boxes, get that stuff on your website and on your landing pages especially. One of our control database collection popups on Light Stalking, just when someone goes there for the first time, they’re showed one popup and that’s it. And it says, “Get photography case studies as seen in National Geographic.” And I’ve not been able to get anything to beat that for conversion into an email subscriber. So if you’re running a local business and you’ve been seen in the local newspaper, put it there somewhere. People will react to it. The next bit that Cialdini talks about is liking. People are far more likely to purchase from people who they like and that goes for websites as well. So you need to project a likable image online. Now, that gets a little bit tricky on a website, I’ll grant you that, but there are a few things you can do. Images of people always win online. I don’t know what it is. It works in Facebook in advertising, it works on landing pages, it works everywhere. If you’ve got an image of a person, and I’m not talking a stock image, I’m talking a real image. Don’t go to a stock agency and get a picture of a model holding your golf club or something. People see through that. I’m talking a picture of you, your family, your pets, whatever. People like people. They like real people. And stay away from formality and corporate jargon. Write how you would speak on your webpages. And of course, social media, as Peter was talking about before, is your friend. Be friendly. Don’t be afraid to let your personality come through on that because people will react to it a lot better, and when they come to your site, they’ll be far more inclined to sign up to your service or buy your product. There’s a website called PetRelocation.com. It specializes in helping you move your pets around the world. Their About page is very clever (Note: it appears to have changed recently, the screenshot Rob is talking about is above). 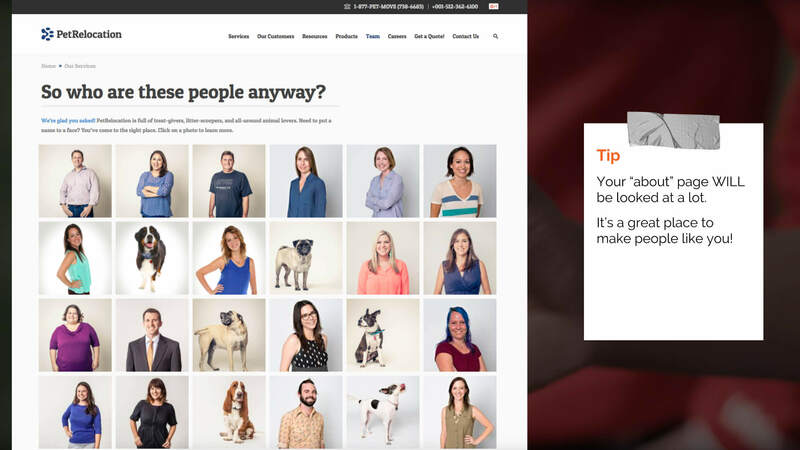 By including images and biographies of themselves, which is something you should do too for your own websites, but also adding images of buyers and their pets, they put themselves firmly in a pet owners peer group and trying to evoke that emotion of, “These are real people. These are pet lovers. They love dogs. I can trust these people. I like them. They’ve got a bit of sense of humour to put their dogs on their About page.” These are all things that I don’t know these guys but I imagine it was done intentionally. If it wasn’t done intentionally, it’s very good gut feel effort. Corporates do this to a big degree. Everyone loves Richard Branson. Stylish design types love Steve Jobs. Geeks can relate to Bill Gates. Investors like the simplicity and straight talk of Warren Buffet. So these are people who injected their personality on their corporations and even though, you know, Microsoft isn’t Bill Gates, but when you think about Microsoft’s product, you are kind of thinking about Bill Gates and, you know, the little geeky guy, he seems all right. So if you’re that way inclined, you’re going to be more inclined to convert on their websites. Another tip — and I think Troy’s going to talk about this later — fast-loading website. It doesn’t make people like you but it will stop them hating you. Another tip — and I think Troy’s going to talk about this later — fast-loading websites. It doesn’t make people like you but it will stop them hating you. There are a few stats on this, but one of them, a four-second load time means 25% of people have already left your site. So before they see anything. I saw a talk from this guy called Vogels, who’s the Chief Technology Officer at Amazon.com, and it was just after one of his staff had made Amazon go down for a day and a half. And they were measuring the losses in thousands of dollars per second. So when these technical guys mess up, they mess up, but when they do a good job of making your site fast, it is worth a lot of money. Amazon is a very fast loading website and I forget what the stat is on what the load time is but they can actually compare load time to a dollar amount and it’s huge for them. So it’s huge for you too. So get a fast website, get a good ISP that’s hosting your website, and make sure you get a person who’s thinking about that. The other thing too, a website that displays well on mobile won’t make people like you, but it will stop them hating you. Fifty percent of my traffic is on mobile at the moment. If you’re running analytics, you probably know what that percentage is. Mobile is just getting bigger and bigger each year so you need to get on that as quick as possible. I was…you know, a personal bias. I messed up. I was like, people aren’t going to come to Light Stalking and buy something from their mobile. And I started playing with Facebook and I said, I’ll throw up a mobile campaign. It outdid my best campaign three to one. So people are buying on mobile and it’s happening right now. So if your site isn’t ready for mobile, then that’s something you should really get on to. Next bit of Cialdini’s thesis is authority. People obey authority figures. There’s a reason that Michael Jordan gets millions of dollars from Nike to sell their basketball shoes, when he does it, people buy them. At the heart of the celebrity endorsement is the concept of authority. If you wanna know how powerful the concept of authority is, Google something called the Milgram experiments. This is a psychology experiment if you’re into psychology. They found that they could effectively get people to torture each other if they’re told to do so by an authority figure. This is another very powerful psychological principle. I’m not asking you to get people to torture each other with your websites, by the way, but you can use authority to get people to buy stuff. There’s a well-known split test by a skin clinic in India where they tested a couple of versions of a signup form. The first one, they were trying to get people to sign up for a skin consultation, and they just tested the copy. Copy A, “For a skin consultation, register here.” B, “I want an expert opinion, sign me up.” The second one — the “I want an expert opinion, sign me up” — increased leads by 137% and 22% for sales. So what’s that? That’s eight words on a webpage. It’s worth testing, again. A lot of these tactics can be that simple. You don’t need to overthink it to implement them. If you have experts on staff, you’re an expert yourself, don’t be afraid to say so. If you’re not an expert, then go and find one. Someone who likes what you do or what you sell and is an expert in the field who can recommend you that could crossover with the testimonial thing, social proof. Experts are very good for selling things, online or off. One other thing regarding authority. You know those little trust badges like SSL website or I Use Visa and Mastercard, stuff like that? They all play into this authority mechanism and they all, in my testing, they all increased conversions. And from my reading, that seems to be fairly universal. So if you have an online security company to look after the security of your website that has a badge, put it your landing page. If you have an SSL certificate which makes your website secure, put the badge on your website so people know. These things all increase conversions, signups, and everything else. And it’s a really easy web, like a five-minute job. The other thing to remember is sometimes ugly websites do beat pretty websites. That’s just a fact. That will depend on your brand and a lot of other things as well but don’t be obsessed with making sure everything’s pretty. And I just wanna stress that point one more time about testing. A lot of these things, I mean, yes, there’s psychology behind it. Yes, there are studies behind it. Yes, there’s a fancy guy with a Ph.D. But you still need to test it. My audience and your audience are different. Yes, these principles tend to apply but sometimes they don’t. Sometimes you just can’t get things working. So just be prepared to test everything. Don’t trust anything I say. Test it for yourself. And on that note, what exactly are we gonna test? These are a few things I always test, especially the top couple. Headlines, graphics. I mean, literally with graphics, it’s astounding what showing them the same product in a different perspective or a different setting can do. And if you do a lot of advertising on Facebook or Google display, you’ll find that you can almost never pick the winner before you’ve got the data. It’s quite depressing after a while because you think you’re getting good at something and then you get blown out of the water once again. I mean, literally yesterday I put up a new Facebook campaign for some stuff on Light Stalking. The clickthrough rate was triple anything I’ve put up before and the sales were consistent. So why didn’t I think of that four months when I started that particular campaign? You can’t. It’s just not gonna happen. So just test a lot of things. Tip: Most hunches are wrong. But if one is right it can be worth a lot of revenue. So start testing! Your headline’s another obvious one. A call to action. What are you going to put in that headline? For example, this talk “Conversion Rate Optimization”, that’s a pretty boring headline, you know. “How you can make an extra $1,000 a month with conversion rate optimization” would have been a much more compelling headline for this talk. So think about things like that. The length of your copy, the length of the page and the written copy on it, sometimes go short, sometimes go long. At least test one. I’m sorry, at least test a very short one versus a very long one so you know, so you actually have the data. As a general rule, an expensive product or a high-end service will require longer copy but it’s worth a test. Price, the greatest element in positioning your brand. I did a split test on price. It wasn’t actually a split test. I ran one price for a few months and then another price for a few weeks after that because you’re not allowed to split test prices. It’s actually illegal in a lot of places. So you actually have to change the price. I split tested $9.95 versus $10. Any guesses which one won? $9.95? $10? Okay. $10 won. Any guesses how much it won by? How many percent? Video versus written copy. As a general rule right now, video is absolutely killing everything. That means on Facebook ads, on landing pages. That will change. People will probably get used to video soon. These things go in waves. But if you want extra sales, again, this doesn’t have to be rocket science. I’ve seen videos that actually show the words that the person is speaking. That’s how simple it is. And they work. I haven’t tested that particular one but I have tested videos on Facebook and they just destroyed banner advertising, for example. If you’re wondering how to get someone to do that sort of stuff for cheap, there’s a website called Fiverr.com which is stuff with people who will do it for $5 and there are actually some talented video producers on there. So you can probably get, like, a 20-second video for $5 and it would probably no more than $50 for something a bit longer. But it’s definitely worth doing and worth testing on both your landing page and also on your advertising. I mentioned trust symbols before, badges and whatnot. Get them up there. The type of guarantee is…does everyone offer guarantees on their products and service? So a 30 day guarantee or something like that? consider it because it does actually result in a change in sales conversion rates. I’ve tested none versus 100% lifetime versus 60 days versus 90 days. For me personally, the 100% lifetime won. Also, makes me a bit happier about that but a lot of people have said that the 60-day return policy actually increases conversions on the front more than anything else. So, again, something to think about. The limited discount, that’s going back to the idea of scarcity. That’s definitely worth a test. And the testimonials, I’ve tested basically the number of testimonials and where I’ve put them. I usually have a couple of testimonials usually close to the Buy button on a landing page and usually close to the Pay Now button on a shopping cart. On the shopping cart, my particular test is five versus four versus two, and five won. So that probably means that the more testimonials you have close to those buttons, the better. But, again, test it. 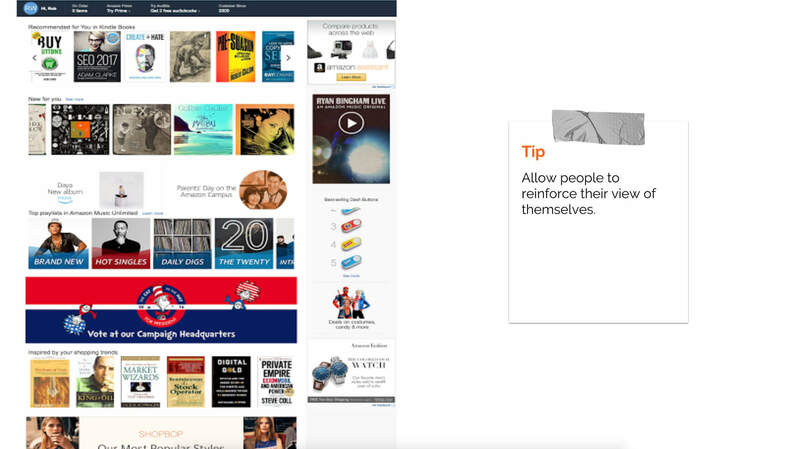 Look at this stuff and look at it again in the context of Cialdini’s six principles and you’ll start to see a lot of stuff that you can apply to your own websites. Revenue optimisation. So I talk a lot about getting more people to buy. What about getting them to buy more stuff? Before I go into it, everyone needs to get a copy of the book “Influence: The Psychology of Persuasion” by Robert Cialdini. If you don’t wanna get the book, there is a summary online and you could probably even find a free .pdf somewhere if you search hard enough on Google. And there’s a great website called ConversionXL.com, which is basically all about conversion rate optimization. But the thing is conversion rate optimization should only be looked at in the context of actual revenue. Are you maximizing the potential revenue of each visit? CRO is a component of a successful website or webpage, obviously, but would you rather have a great conversion rate or more money in the bank? They’re not mutually exclusive but revenue and profits beats having a nice spreadsheet. And the thing about this is there are a lot of actual things you can do on your shopping cart to increase total order value of an online sale. How many people are actually doing direct sales online versus just lead generation? Sales? Okay. A few of you. The order bump is the first thing we’re gonna talk about. The order bump is the online equivalent of, “Would you like fries with that?” It’s a product that compliments the main product purchased but it’s at a smaller price. So if you sell motorcycle jackets, do they want gloves? You sell golf clubs, do they want shoes? If you sell insurance, do they want an extra year at a slight discount? The thing about order bumps is that they should be simple, that you can sell them in a few lines. Like, literally you have three, maybe five lines of copy in a box on a page to sell this, so it needs to be simple. They need to be able to get it straight away. And it needs to be complementary to the product which they’ve already sold themselves on. That’s an example of an order bump. It’s not the greatest example I’ve ever seen but number four, the box down there, it’s just one-time offer. If you tick that box, suddenly the price goes up and then you go through the normal checkout process. I’ve done experiments with the order bump, I’ve gotten up to 60% of people to tick that order box. So it is possible to make a lot more than your initial sale. So 60% of people at 70% of the initial cost, so you can do your own maths there. That being said, like 20%, 30% is probably pretty easy to get for you in terms of conversions. The next one, of course, is the upsell. The single most profitable page of a transactional website is usually left blank. When somebody has just purchased from you, they have a revealed a few things. They trust you. They want a specific thing enough to take out a credit card. That’s actually really hard to get someone to do online, so congratulations already. They’ve revealed what that specific thing is. They probably somewhat like you or your website because they’ve trusted you. They regard you as somewhat of an authority. They’re probably in a group of peers. So if they’ve purchased golf clubs, they’re probably a golfer. And they identify with a specific item that they’ve just purchased enough to actually buy it. Let them continue the process with you. So what are you showing them on that immediate page following where they’ve just made a purchase? The Thank you page of your website is the perfect place to make another sale. This is called an upsell. They’ve just qualified themselves as your perfect prospect and, at a bare minimum, you should be able to convince 10% of them to buy something for triple the price that they just purchased something for. You can probably get that as high as 20% if you keep working on that. 20% at 300% of the price. Your job is to put that thing in front of them right now using the same elements of persuasion we talked about in the first bit. The upsell should be related and complementary, same thing as the order bump. If it’s technically possible…I’m not sure what sites you’re on, but if it’s technically possible, it should be a one-click purchase. Amazon does this really well. This is what happens. 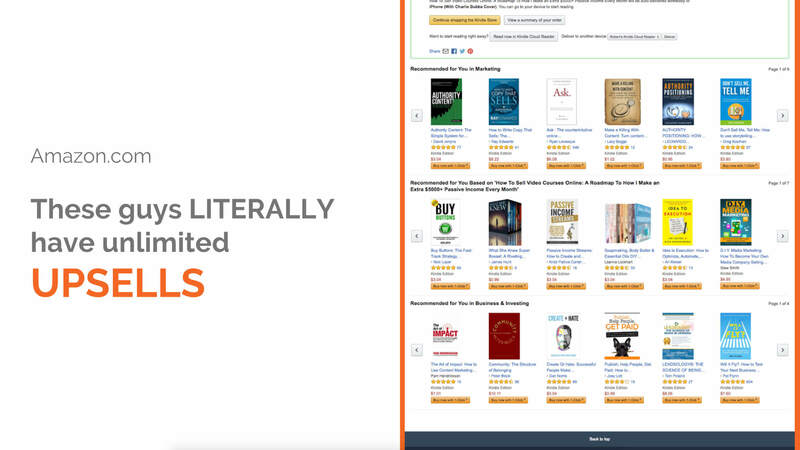 So this is the page immediately after I’ve purchased a Kindle book on Amazon. They give me a bunch more Kindle books and they’re all this time, unlike the last time, this time they’re all Kindle books and they’re all related to the thing I just purchased. And this goes on forever. If I keep clicking, “Yes, yes, I’ll have that one. I’ll have that one,” I can buy all of Amazon. It’ll take a while, and then that’s a one-click purchase, by the way. I don’t have to put my credit card in. I don’t have to do anything else. Just buy now, bang, buy now, bang. So they take you through this process. What are the things that they do? It puts my mind at ease that I’m in the right place, for a start. So there’s a little box up at the top saying, you know, Hi Rob, welcome, you just purchased the right thing, you’re in the right place. It shows me only Kindle editions because that’s what I’ve just purchased, so it gives me something very similar in terms of the format. It’s only titles that are related to what I just purchased. Notice there are none of my big idea books, there are no history books, there’s no books about grain or oil or anything like that. That’s very intentional. I’m in the buy mode now so they know that this is the best time to hit me. If they hit me specifically, they could probably get me to buy again. 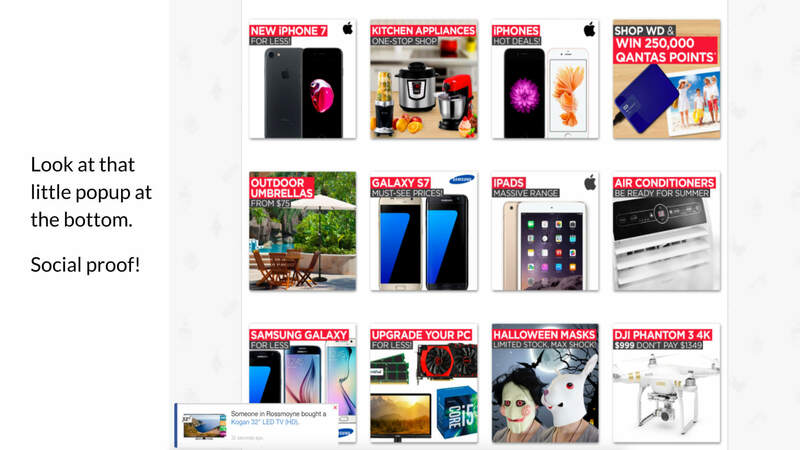 All of them are one click and all of the upsells actually have social proof on them. So just notice the star rating on each of them with all of the reviews. And that just goes forever. Now, this is slightly…this is what you’d probably call a sidesell. They’re haven’t gone more expensive. They’ve gone stuff about the same cost as what I’ve purchased, but a sidesell goes forever. I know the traditional way to do it is an upsell, as I said, 300% and then a downsell, which is the same price as the initial purchase. so basically, that ratio is one three one if you look at upsell and downsell. It will get you a big…you know, one quick sale will get you big conversion rates on both the downsell and the upsell as well. So if that means someone’s purchased a wallet for $50, you upsell to a bag for $150 and then you downsell to like a travel satchel or something like that for $50. Same as what they paid initially. You can go on with that forever, but again, if you’ve got a few things there, you’ve got…and this is probably why Amazon does the sidesell thing. The upsell and the downsell is starting to get very market-y. So it does have an impact on your brand and how people perceive you. The sidesell, not so much, so you might wanna go with that, which is perfectly legitimate too. The final thing you should be playing around with are the email follow-ups. When someone’s purchased something from you, they’ve broken the seal. They trust you, they like you, and hopefully you’ve sold them something good so they’ll love your product. What do you do then? This is where you start maximizing lifetime customer value using their email. The database as Peter was referring to. This should be part of every commercial project if you’re selling, if you’re in e-commerce, if you’re collecting leads, it doesn’t really matter. Email works. If you’re not doing it, you should be on it. After the initial sale, it’s basically free to market to these people for ever and ever. But you gotta treat them well. The thing is if they’ve purchased from you, they already like you, so you’d probably be surprised how much they want some of the stuff you can sell them or send them or give them. As a general rule, I always try to send at least three pieces of actual useful content for every sales pitch or every commercial email I send, and that’s probably at the lower end. For a lot of SMEs, I’d be making sure people just are getting useful stuff from me over and over again. When you’ve got stuff to offer them you can do that via email. So basically, just reiterating what I’ve talked about. It’s probably quite a bit of information. So, three key points you should probably take away. 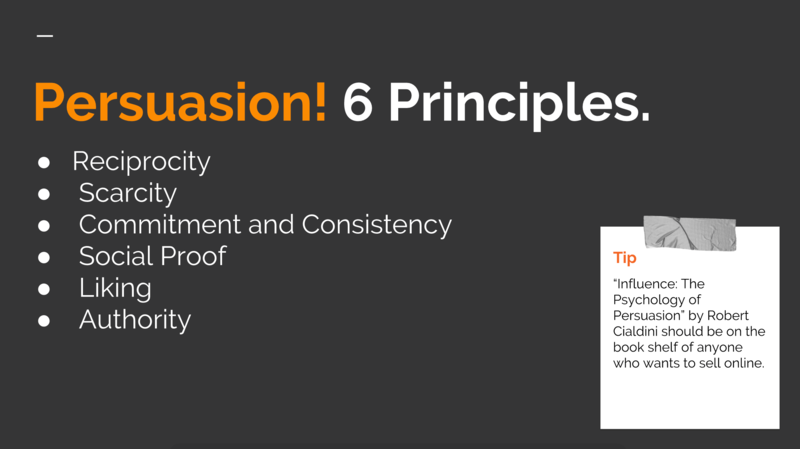 Cialdini, Robert Cialdini, learn his six principles and just ask yourself on every page you’re looking at, can I spot these six principles? On your own page, make sure they’re there. But remember that his six principles are only a subset of revenue optimization. If you’re not making money, the conversion rate doesn’t really matter. And the last thing is test everything. I hope I’ve reiterated that because I’m probably wrong. Thank you.